With several years of experience, our scaffolding erectors work in an efficient and reliable manner to ensure that the job runs as smooth as possible, keeping on time and on budget. For a free quotation, why not contact us today where we will be more than happy to help you further. With our own in-house fleet of vehicles and mechanical loading facilities, we are a professional scaffolding business offering competitive prices and high quality services. Whatever your building size and structure, our professional scaffolders will provide all the necessary help and advice on the most suitable scaffolding system you require. Our scaffolding services in Swindon are of high quality, with friendly and reliable services from the beginning to the end of the job. It is hard to distinguish the differences between scaffolding companies in Swindon, however AGC System Scaffolding will cater for all of your requirements, no matter how large or small they are. 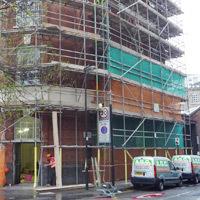 Our scaffolding services are provided to both domestic and commercial customers and have a proven track record of highly satisfied customers, both old and new. This alone sets us apart from other scaffolding companies. With over 20 years of experience, AGC System Scaffolding not only provide scaffolding towers and systems for domestic and commercial customers, but we also buy quality new and used scaffolding equipment at competitive prices throughout Swindon and the nearby local areas. Our commercial scaffolding services are tailored to suit your budget and requirements and can be used both indoors and outdoors for domestic houses and construction sites of all scales and sizes. Our scaffolders use the latest materials and equipment, including trestles, tubes, boards and fittings, all of which are transported to your home or business by our very own vehicles. We have a wealth of knowledge and experience with the scaffolding industry, making us a very competitive scaffolding company.